The accurate and grid-free prediction of the diffusion of vorticity is an essential component of the Lagrangian Vortex-Boundary Element Method for viscous flow simulations. Traditionally, diffusion has been emulated via the Random Walk Method, which is known for its low accuracy and convergence rate as well as the statistical noise it introduces to the computed flow field. Alternatively, a number of deterministic methods for the accurate prediction of diffusion have been developed in recent years. Most of these methods are not truly grid-free as they require frequent remeshing onto a uniform background grid to improve long time solution accuracy. This diminshes the appeal of grid-free computing since remeshing is a fairly complex procedure near the boundaries, and it introduces some level of numerical diffusion into the computation. In addition, the positivity constraint precludes the formulation of arbitrarily high order schemes with most methods. A new deterministic scheme called the Vorticity Redistribution Method (VRM) [*] alleviates the above-mentioned difficulties altogether. Truly Grid-Free - Unlike other deterministic methods, VRM does not require frequent remeshing or a background grid to maintain long time accuracy, and it is free of numerical diffusion. Arbitrarily High Order with Positivity - VRM is capable of predicting diffusion at high accuracy and high rates of convergence, while maintaining positivity. Other methods can at best be second order accurate. Intelligent Particle Insertion Strategy - The VRM formulation mathematically detects when and where new vortex particles must be added to the computational domain to mimic the (physical) expansion of the vorticity field due to diffusion. Other methods use ad hoc user specified particle insertion strategies. For this project, we have developed a (better than) third-order VRM for 3D diffusion of vorticity in free space ,. The robustness of the high-order VRM is demonstrated using the diffusion of a 2D point vortex singularity as one test case. This is a vortex point with infinite vorticity and zero support area, but its circulation has value one. We should emphasize here that no other deterministic method for diffusion can solve this problem, since they all discretize the vorticity field (which is initially singular) rather than circulation. In VRM, the point vortex is initialized using one particle with unit circulation. New particles are inserted in subsequent time-steps, as necessary, to emulate the expansion of the vorticity field due to diffusion. Note, since VRM is an explicit scheme, the inter-particle separation is nominally set in the order of the diffusion length scale for stability reasons. (Viscosity is one for this problem). (right) the LO and HO convergence rates, measured as the L2-norm of the error versus the diffusion length scale. The figure on the left reveals that the predictions by HO using dt = 0.01 and LO using dt = 0.001 are indistinguishable from the exact solution, whereas LO using dt = 0.01 displays some discrepancy. Indeed, various test cases have demonstrated that HO using an order of magnitude larger time-step than LO is more accurate, and it requires about 3.5 times fewer particles and three times less cumulative CPU time than does LO to solve this problem! The figure on the right shows a second-order convergence rate (in inter-particle separation) for LO, and better than third-order (order 3.6) for HO. This is a significant achievement since all other grid-free methods can at best be second-order to maintain positivity. 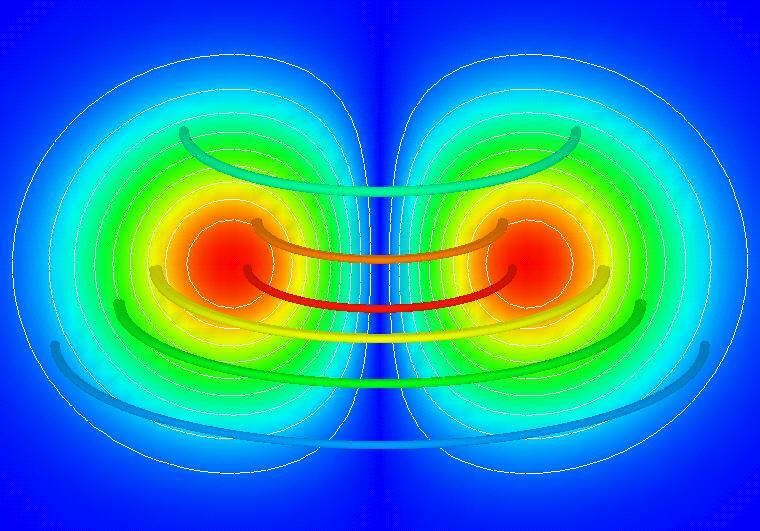 This example demonstrates how effortlessly complex topologies are handled by VRM; e.g., the interface between oppositely signed vorticity fields as they approach each other. Here, a pair of vortex points with unit initial separation, and with infinite vorticity and zero support area, and circulation values ±one are diffused into each other with unit viscosity. The following animation depicts the time evolution of the scattered computational elements (vortex particles), which are color coded by their circulation values. The following figure depicts the corresponding vorticity profile along (x, y = 0) at various time levels, as obtained by the new High-Order VRM (HO) using dt = 0.01. The predictions match the exact solution with excellent accuracy. Note how well the symmetry of the vorticity field as well as the slopes of the profiles near the axis of symmetry are captured, despite the fact that the particles are not distributed with any particular order and/or regularity. The 3D high-order VRM is as accurate and as simple to implement as the 2D case. 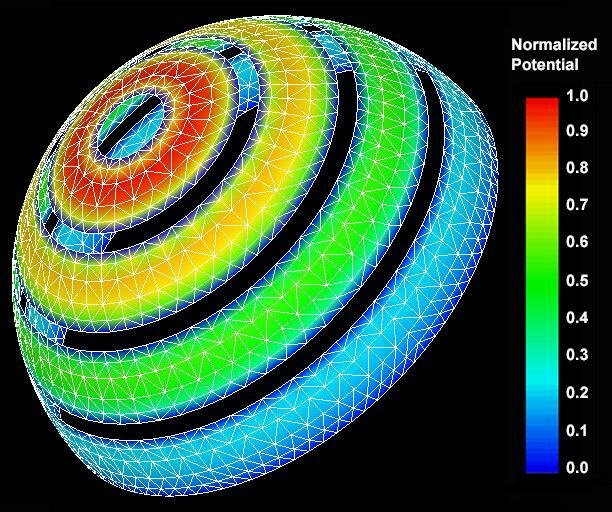 Here we demonstrate this capability by simulating the diffusion of a 3D infinitesimally thin vortex ring with unit radius, circulation and viscosity. The evolution of the vortex particles in time is animated in the figure at the top of this page. Again, note that the particles are scattered with no particular order. More importantly, no special care is necessary to accommodate the "gridding" of the ever shrinking inner hole in the "donut" as the vortex ring/torus expands. That is, the same strategy that is used to diffuse an isolated point vortex is used to diffuse the torus front as it merges with itself in the inner section of the donut. The following figure depicts a cross-sectional cut and selected vortex tubes from the diffused vortex ring at time level T = 0.2, as predicted by HO using t = 0.01. The colors represent the vorticity magnitude normalized by the maximum in the field. Note how well the field symmetry is preserved. * S. Shankar and L. van Dommelen, "A new Diffusion Procedure for Vortex Methods," Journal of Computational Physics, Vol. 127, pp. 88-109, 1996.